A motion made by the Pitcher to deliver the ball to the bat without delivering it, except the ball be accidentally dropped, or The ball be held by the Pitcher so long as to delay the game unnecessarily, or Any motion to deliver the ball, or the delivering of the ball to the bat by the Pitcher when any part of his person is upon ground outside the lines of his position. When after being once warned by the Umpire, the Pitcher continues to deliver the ball with his hand passing above his shoulder. Confused? So are the umpires. Maddon: "Matt, how could you possibly balk right here? 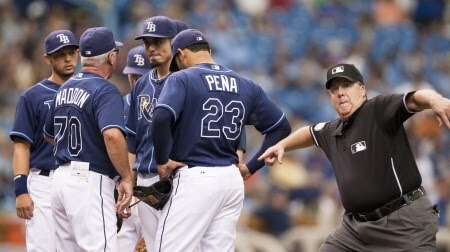 Two nights in a row, how could we possibly have that same balk call called against that we pretty much do all the time". Cederstrom (ump): "Are you talking to me?" Maddon: "No ... I'm talking to my pitcher. (to Garza) Matthew ... every other pitcher in the big leagues does this on a consistent basis and never gets called for this." Garza held his glove in front of his mouth so he wouldn't laugh. Cederstrom ejected Maddon for the third time this season. The Rays went on to beat the Padres in that game 5-3.